The TDR Handbook (Island Press, 2012), predates four publications that greatly expand understanding of New York City’s use of TDR. In May 2013, Kate Gilmore completed a thesis for her Master’s degree at Columbia University entitled A Process Evaluation of New York City’s Zoning Resolution (ZR) 74-79: Why Is It Being Used So Infrequently? (Gilmore, 2013). This thesis offers helpful context for the adoption of New York City’s Landmarks Law and the 1968 adoption of ZR Section 74-79 which allows the owners of designated landmarks to transfer unused development opportunity not just to adjacent receiving sites (as with the zoning lot merger process) but also across streets and intersections and through abutting chains of lots under common ownership. Throughout its 47 year history, ZR Section 74-79 has preserved only 10 landmarks. Gilmore offers three reasons for this underwhelming rate of use: 1) limiting the permitted bonus to 20 percent of the receiving site’s base density reduces motivation for lots with low baselines; 2) the Special Permit process required by 74-79 adds cost, time and uncertainty, and; 3) proximity requirements limit the applicability of 74-79, particularly when developers can use the Zoning Lot Merger option, which is ministerial and therefore faster, cheaper and more certain. India House was preserved by a Landmark Program (Section 74-79) transfer of 123,857 square feet to a receiving site at 7 Hanover Square. In October 2013, the Furman Center for Real Estate & Urban Policy, New York University, published a study entitled Buying Sky: The Market for Transferable Development Rights in New York City (Furman, 2013). This study scrutinizes TDR transfers occurring between 2003 and 2011 in New York City, estimating that developers paid more than $1 billion for TDRs during this time period. During this time period, the landmarks tool (ZR Section 74-79) accomplished two transfers while 34 transfers occurred under the Theater District and other special district TDR programs and 385 transfers occurred by zoning lot merger, the ministerial provision available to all abutting lots. 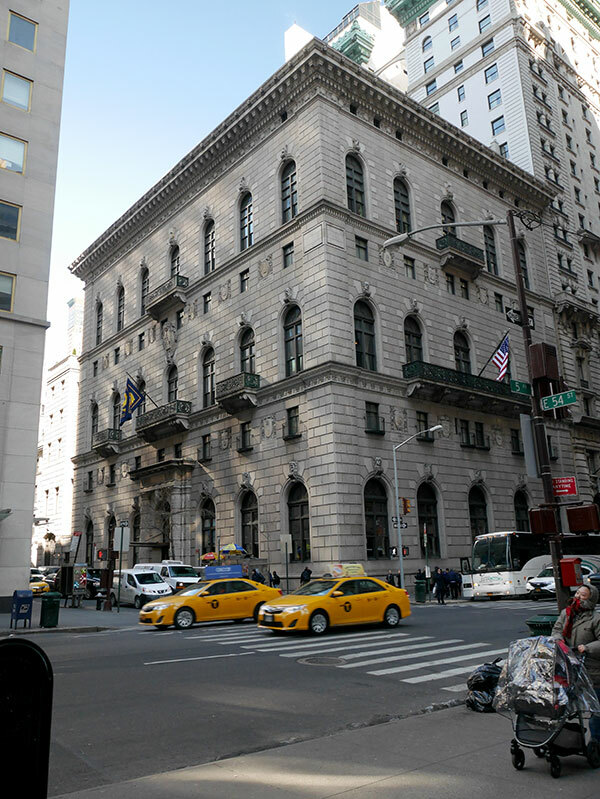 The University Club was preserved by a 2009 transfer under Section 74-79. In March 2014, the Furman Center followed its 2013 report with Unlocking the Right to Build: Designing a More Flexible System for Transferring Development Rights (Furman, 2014). This report uses the findings of the prior report to argue for a retooling of the ZR 74-79 landmarks TDR program so that sending site owners have more potential users for their unused development rights. The report concludes that many benefits could result from this zoning code rewrite since the City has 1,400 designated landmarks. In the portion of Manhattan south of Central Park alone, the report estimates that landmarks hold 33 million square feet of unused development rights, enough transferable floor area to accommodate 33,000 additional residential units in receiving sites. Using TDR to create more housing units would relieve housing shortages and restrain rising housing costs that are forcing 47 percent of low-income renters to spend more than half of their income on rent and utilities. The Tiffany Building was preserved by a Section 74-79 transfer of 173,692 square feet of unused floor area. As reported in the 2014 Furman study, although only two landmarks were preserved under ZR 74-79, 27 other landmarks were able to sell TDRs during this period using the Special District and zoning lot merger mechanisms. The report also notes that all three types of TDR mechanisms are hamstrung because TDR changes FAR limits while often not relaxing other development requirements, such as building height, and setbacks, which also define the achievable building envelope. Developers can seek exceptions to these non-FAR requirements using the special permit or variance applications but the report suggests that these processes are strict and likely decrease the appetite for TDRs. In addition, a New York State Law limits residential buildings to 12 FAR, a scale that many developments can reach by incorporating affordable housing under the city’s Inclusionary Housing Program. In 1984, Section 74-79 was used to preserve the First Police Precinct at 20 Old Slip. In 2015 the New York City Department of City Planning released A Survey of Transferable Development Rights Mechanisms in New York City, which this update refers to as the 2015 Survey (NYC, 2015). This 55-page report was prepared to coincide with “Trading High in the Sky”, a symposium designed to evaluate the city’s current TDR programs and kick off a planning process on the future of TDR in New York City. (For more on the symposium and the planning process, please see the Smart Preservation March 2015 Newsletter.) The 2015 Survey, provides a wealth of information about all of the City’s TDR programs including Zoning Lot Mergers, Landmark Transfers and Special District TDR programs. Zoning Lot Mergers (ZLM) allow separate, contiguous lots within a block to eliminate lot lines for zoning restriction purposes. The 2015 Survey explains how the original 1916 ZLM process allowed the construction of the Empire State Building in 1931. Changes were made to ZLM provisions in 1961, 1977 and 2001 after the Trump World Tower created controversy by concentrating development on 13 percent of a large merged zoning lot. Today, ZLMs have facilitated several extremely tall towers in parts of Midtown that are not within contextual districts and consequently have no height limits. These ultra-high towers have drawn complaints from community organizations and the Municipal Arts Society, which published a critical report entitled “The Accidental Skyline”. ZLMs are not required to achieve policy goals. But, as the Furman studies found, landmarks can be, and often are, included in a merged zoning lot. The ZLM process requires no City approvals other than the recording of a Zoning Lot Development Agreement. According to the 2015 Survey, additional restrictions on ZLMs based on ownership might be hard to justify. “Restrictions on the ability to merge them into unified zoning lots would give land use effect to tax lot lines, often without an underlying land use rationale. That may present legal and administrative problems” (NYC, 2015, p 6). This section on Landmark Transfers refers to the New York City Zoning Resolution 74-79 explained above. The TDR Handbook correctly summarizes the 74-79 mechanism but reports that this code procedure generated “less than two dozen transfers”. The 2015 Survey clarifies that between 1972 and 2009, Section 74-79 preserved 11 landmarks including Grand Central Terminal, India House, Old Slip Police Station, Tiffany Building and University Club for a total transfer of 1,994,137 square feet. An additional transfer between parts of Rockefeller Center was approved but not built. The 2015 Survey explains that the use of Section 74-79 has been hampered by three factors. 1) The Special Permit needed for approval is time consuming and costly (estimated by one expert to be $750,000). This partly explains why developers seek other means of transferring floor area including the ZLM process. 2) The sending and receiving proximity requirements limit the sites where landmark floor area can land. 3) Although NYC has 1,300 landmarks, only 466 have unused development potential and many of these have so little unused potential floor area that transfers are functionally infeasible. A transfer between parts of Rockefeller Center was approved under the Landmarks program but not built. The TDR Handbook describes the current mechanism that allows 30 listed landmark theaters to transfer unused floor area throughout the Theater District, (using less-demanding procedures than those required under Section 74-79), in return for theater rehabilitation, commitment to operate a legitimate theater for at least five years and contribution to a Theater District Fund. The TDR Handbook identified only one theater preserved by this program. However, the 2015 Survey reports that 15 transfers have occurred to date, transferring 473,546 square feet of floor area and preserving six theaters: Hirschfield, St. James, Broadhurst, Booth, Shubert and Majestic. The 2015 also provides insights about the special considerations that made this TDR program possible and the history of amendments and false starts that preceded the current program. The Theater District mechanism has transferred floor area from six theaters including the Hirschfield. New York City created the Grand Central Sub-district of the Special Midtown District in 1992. Grand Central Station contains the overwhelming majority of TDR available for transfer here. The 1992 provisions allow receiving sites anywhere within the sub-district a bonus of one FAR by certification for floor area transferred from a sub-district landmark. By special permit, receiving sites in the sub-district core can transfer floor area up to a maximum limit of 21.6 FAR. The 1998 rules aim to facilitate further transfers of Grand Central Terminal’s unused floor area (calculated as 1.7 million square feet in 1998), while precluding a receiving site from gaining an unlimited bonus. The 2015 Survey reports that this sub-district program has seen five transfers from Grand Central Terminal. When a 1979 transfer under Section 74-49 is added, a total of 488,036 square feet have been transferred from Grand Central Terminal, leaving 1,224,109 square feet of unused development potential to yet be transferred. The 1968 Landmarks TDR program and subsequent programs have transferred almost 40 percent of the unused floor area from Grand Central Terminal. In 2005, New York City adopted the Special West Chelsea District, which included a transfer mechanism to facilitate the transformation of the High Line from an abandoned rail line to a linear, elevated park. The sending area includes a 100-foot wide corridor just west of 10th Avenue between 19th and 30th Streets. The program evolved when owners of constrained properties agitated for removal of the rail infrastructure. Rather than demolish the rail line, the City committed to creating a new neighborhood amenity and allowing owners of land in and near the High Line to transfer unused floor area to receiving areas in most of the nine subareas in the West Chelsea District. TDR can be used to increase receiving site development by 1 FAR in some subareas and 2.5 FAR in subareas where additional development is appropriate. Receiving sites are required to use a minimum amount of TDRs first and then maximize FAR using other bonus means, including bonuses for affordable housing and a fund dedicated to the restoration and development of the High Line. The 2015 Survey refers to this prioritization requirement as tranching. TDRs transfer by Notification, which the 2015 Survey notes is the least onerous procedure used in any of the City’s TDR programs. TDR prices have ranged between $200 and $400 per square foot. As of 2015, over 400,000 square feet of floor area has been transferred in 26 transactions. The IAC Building, designed by Frank Gehry, as viewed from the High Line, the elevated linear park facilitated by the TDR mechanism in the Special West Chelsea District. The South Street Seaport TDR mechanism is described in The TDR Handbook. The 2015 Survey notes that the South Street Seaport is the only New York City TDR program to use a TDR bank to date. The TDR Handbook states that almost all of the TDRs in this district have been transferred. To be more specific, the 2015 Survey reports that all but 340,000 square feet of the 1.4 million square foot supply of transferable floor area has landed on district receiving sites. In 2007 and 2008, TDR prices in this program ranged from $110 to $150 per square foot. The South Street Seaport is a popular destination on the partly-completed East River Esplanade. This District, adopted in 2005, abuts the north end of the West Chelsea Special District. There are two TDR mechanisms at work here designed to provide 24 acres of public open space with linkages to the High Line. One TDR procedure creates parkland from the Eastern Rail Yards owned by the Metropolitan Transportation Authority while the other provides for compensation to the owners of privately-owned land that is planned to become public parkland. Developers can also exceed baselines using District Improvement Bonuses (DIBs) obtained by making payments to a fund for district improvements including affordable housing and open space. However, as in West Chelsea, bonus development must observe “tranching” procedures that require a mix of TDR and other bonuses to achieve maximum FAR. Each square foot of TDRs from the land owned by MTA, a public agency, are priced not by private negotiation but as 65 percent of the appraised value of each square foot of floor area buildable as a matter of right on the receiving site. One development calculated this value at $350 per square foot of transferable floor area. Experts state that almost all the transferable floor area available under the Hudson Yards program has already been sold although not yet submitted for certification. Using TDR, bonus development in the Special Hudson Yards District (background) will create public open space linked to the High Line (foreground). Manhattanville is a 35-acre area on the Hudson River which Columbia University plans to develop into a new campus with residential and commercial development. The special district, created in 2007, aims to create 1.6 acres of open space using three transfer mechanisms. The Notice mechanism allows Columbia to transfer rights from the open space it creates. The Authorization process allows other transfers that do not require modifications of height/setback regulations while a Special Permit process must be used for receiving site buildings that do require such modifications. The City Planning Commission formed this 20-block district in 1973 in an effort to preserve Lundy’s Restaurant by providing a mechanism for this local institution to transfer its unused floor area elsewhere within the District. Although the SSBD is only 20 blocks in size, its regulations include eight separate subareas with different development requirements. The mechanism allowed for the creation of a TDR bank and the 2015 Survey speculates that the SSBD was hoping that a bank would accept TDRs as payment for lapsed debt obligations (as occurred successfully in the South Street Seaport). But no transfers occurred under this program and Lundys closed in 1977. The 2015 Survey observes that this program was probably hampered by a slow real estate market in Sheepshead Bay and low baselines (FAR 1 or 2) which may have made transfers uneconomical. This district was created in 2009 to revitalize Coney Island, including the use of TDR to preserve the landmarked Childs Restaurant. Transfers can occur between properties in one of the district’s four subareas as a matter of right. A proposed project with an amphitheater incorporating transferred floor area was approved in 2013 but has not moved forward due to various obstacles including the destruction caused by Hurricane Sandy. New York City created the Special United Nations District in 1970 to promote redevelopment of the blocks surrounding the UN Complex, an area bounded by East 43rd and 45th streets between First and Second avenues. The TDR mechanism here functions like a NYC procedure called a Large Scale Development Plan. With certain limitations for the subarea on the south side of 44th Street, the TDR mechanism allows bulk to move throughout the district despite zoning lot lines and streets and without regard to height and setback requirements. The process requires no approvals other than recordation of the transfer documents. Furman Center for Real Estate & Urban Policy. 2014. Unlocking the Right to Build: Designing a More Flexible System for Transferring Development Rights. New York: New York University. Gilmore, Kate. 2013. A Process Evaluation of New York City’s Zoning Resolution (ZR) 74-79: Why Is It Being Used So Infrequently? New York: Columbia University.